Cultural landscapes may be urban or rural, and they include parks, gardens, historic sites, agricultural landscapes, and ethnographic landscapes. Often cultural landscapes are “protected” landscapes, recognized as World Heritage Sites, National Parks, National Heritage Areas, or bounded and designated in some other way. Other cultural landscapes may not be officially designated but encompass landscapes reflective of a particular culture or interactions of several cultures and the patterns they have developed socially and on the land. Cultural landscapes are places with significance and meaning for those who create them, live in them, or experience them as visitors. What Is Cultural Landscape Management? Cultural landscapes are now recognized nationally and internationally as a significant category of cultural resources, demanding specific theory, training, and practice for successful conservation and management. Cultural landscape management draws on a body of knowledge and skills developed in the fields of landscape architecture, planning, heritage conservation, historic preservation, public history, and anthropology over the last thirty years. Because of the importance of cultural landscapes to communities and their “sense of place,” many different government agencies, as well land trusts and other non-profit organizations, have incorporated the identification, documentation, and management of cultural landscapes into their responsibilities and activities. Cultural landscape management requires written and graphic research, documentation, and analysis of landscapes. Sources of data include historic documents, maps, and plans, but also interviews and other consultation with the people who live in, and have shaped, landscapes. Cultural landscape management also involves the production of proposed plans, landscape designs, and interpretive schemes for places in order to serve the needs of residents, managers, and visitors. 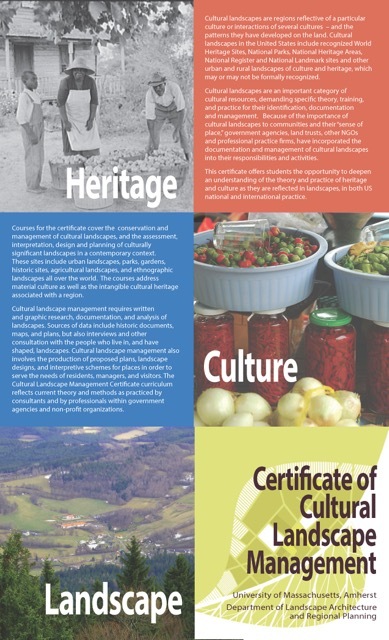 The Cultural Landscape Management Certificate curriculum reflects current theory and methods as practiced by consultants and by professionals within government agencies and non-profit organizations. Internships or applied experiences with a specific emphasis on heritage or cultural landscape management may be approved by the certificate program director in advance as a three-credit elective. 3. Elective Courses Group II (up to 3 credits): One course from this list unless student takes all electives from list above. The list is subject to change depending on department offerings. The Cultural Landscape Management Certificate is available to University of Massachusetts graduate students enrolled in a degree program in any department. The certificate is also available to non-degree students through enrollment in the University of Massachusetts Continuing and Professional Education (for application and enrollment policies, see http://www.umassulearn.net/). All applicants for the certificate should submit a brief statement of interest by email to the certificate program coordinator, Elizabeth Brabec, for admission to the program. The email should indicate the candidate’s reasons for interest in the certificate program, and outline the suggest program of courses. Applicants should contact Elizabeth Brabec at ebrabec@larp.umass.edu to discuss the selection and timing of courses.